Members of the 2014-15 Eastern girls basketball team pose for a picture after earning the Division IV Southeast District runner-up trophy following a 50-35 setback to South Webster at Jackson High School in Jackson, Ohio. Eastern sophomore Hannah Barringer (21) gets a good look at a shot attempt in front of South Webster defender Kimber Johnson, right, during the second half of a D-4 district championship girls basketball contest at Jackson High School in Jackson, Ohio. 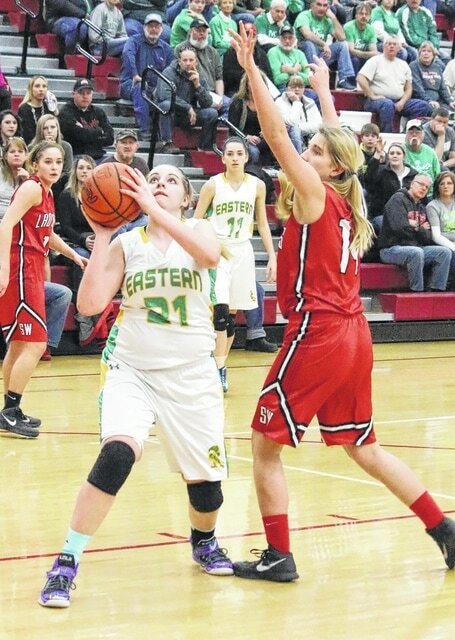 It was the top story in the Ohio Valley Publishing area during the 2013-14 campaign, but nobody expected the Eastern girls basketball team to be back in the top-five this year. Then again, after losing five senior starters from their Division IV state championship squad, nobody really knew what to expect from the Lady Eagles this past winter. Needless to say, the Green and Gold still found ways to silence critics — much like they did the season before. An historic run came to an end as the Eastern girls basketball team had its 10-game postseason win streak come to a grinding halt during a 50-35 setback to top-seeded South Webster in a Division IV Southeast District championship game at Jackson High School in Jackson County. The sixth-seeded Lady Eagles (19-7) weren’t expected by most to win their 10th consecutive sectional crown this winter, but the Green and Gold defied the doubters and advanced to the program’s sixth straight district final — and 10th overall. The clock, however, finally struck midnight on Eastern’s magical 2014-15 campaign, as the Lady Jeeps (22-1) led the final 23:05 of regulation in advancing to the Sweet 16 for the first time since the 2009-10 season. SWHS, coincidentally, defeated the Lady Eagles 62-58 in a district final at the Convocation Center that postseason — which was the last time that EHS failed to reach the regional tournament. It was also only the third time in seven seasons under John Burdette that Eastern failed to win 20 games. The Lady Eagles played mostly sophomores and freshmen, most of whom were playing significant minutes for the first time in their varsity careers. EHS stumbled early on, but still managed to finish behind only Waterford — the 2015 D-4 state runner-up — in the TVC Hocking standing standings. It was the postseason run, however, that made Eastern fans rekindle some recent memories. The Green and Gold defeated Green by a 62-11 margin in the opener, then the Lady Eagles avenged an early-season loss to Ironton Saint Joseph (53-48) to advance to the district tournament. Eastern then extended its remarkable postseason winning streak to double digits in a thrilling fashion, topping second-seeded Portsmouth Notre Dame by a 52-43 count in overtime to advance to the district final. EHS never trailed against PND and outscored the Lady Titans by a 9-0 margin in the extra session. Burdette spoke in the district final loss to South Webster about how the team’s growth throughout the regular season helped the Lady Eagles reach such a traditional point. He also noted that this could be the beginning of something even bigger. “I don’t figure that a lot of people thought we’d be back to a district final this year, but we were. These girls have worked hard and did the things in practice that need to be done to be successful, so we were not surprised to be here,” Burdette said. “Honestly, we are just really young and not mature enough to handle the situations that come up on the court just yet. Then again, there aren’t that many freshmen and sophomores who get this kind of opportunity. Hopefully when they get to be juniors and seniors, it’s bound to pay off. The 2014-15 squad loses only two seniors, Breanna Bailey and Lindsay Hupp, both of whom were part of last year’s state championship squad. The Lady Eagles are set to return all five starters and a handful of key reserves, as well as having some new weapons up from the eighth grade squad. Eastern has previously appeared in 2006 and 2010 district finals and also advanced on to regionals after winning district crowns in 1995, 1999, 2004, 2011, 2012, 2013 and 2014. EHS also won 20 or more games under Burdette in 2010, 2011, 2013 and 2014. The Lady Eagles — along with the Southern boys — were also the only OVP area basketball teams to get out of the opening round of the postseason.